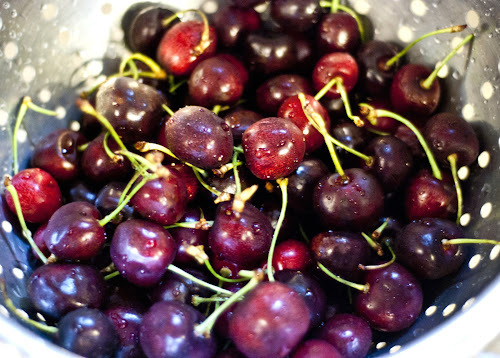 Whole Foods had an amazing sale on organic cherries last Friday, July 8 ($2.99/lb). I didn't waste any time heading over that morning and buying 4 bags. My lovely friend, Junia of Mis Pensamientos, also informed me about the cherry recipe contest being hosted by Whole Foods. I had no intention of entering but then I figured what the heck (and who couldn't use some free grocery spending money?). Truth be told, I am not a huge fan of cooked cherries. I prefer them pure and untainted, and it seemed wasteful to do anything but pit 'em and eat 'em. But I pressed on. I tried a few things from fruit salad with adzuki beans, to tofu and edamame drizzled with cherry sauce, to a fruit and bean smoothie. 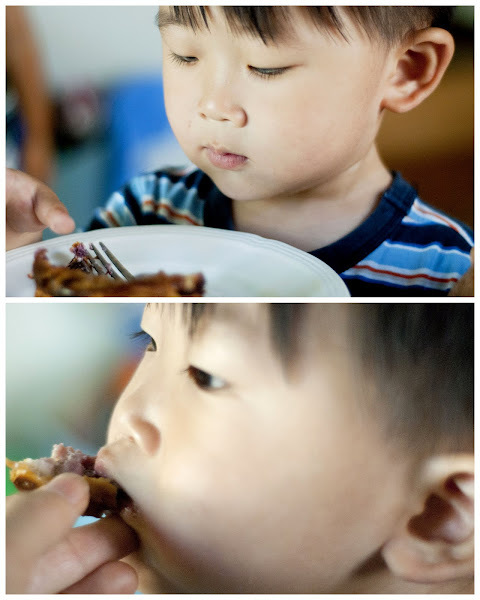 But either the flavors didn't work together or the kids didn't really care for it (like the tofu with cherry sauce). I knew I had to stick with a dessert, and then I finally caved in and decided to bake (which I was trying to avoid in this crazy hot weather). So with it being nearly 100 degrees today, I cranked up the air conditioner, turned on the oven, and created a fruit and cheese filled quiche tart. And the flavors of the cherries, pineapple, and strawberries worked beautifully together. The best part about it is how simple it is to make with a few ingredients, including a refrigerated crescent roll (yes, Whole Foods carries a product manufactured by Immaculate Baking Company). My older son loved helping me out. The pictures above show the quiche being baked in individual ramekins (7 ounce size) which gives it a more sophisticated presentation. But it takes longer to bake than it does in a muffin pan. I made two batches and used both (the instructions below indicate the muffin pan). So while I prepared lunch and fed the boys, dessert was baking in the oven. 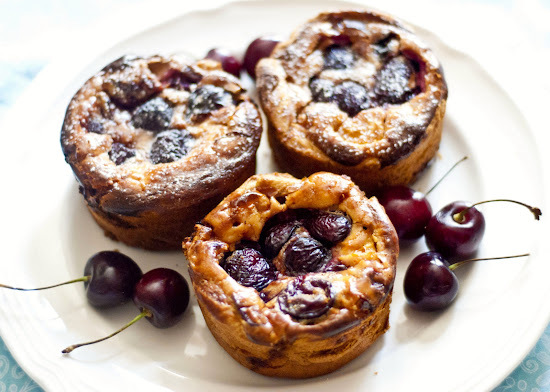 And the wonderful aroma that filled the kitchen made me reconsider my dislike of cooked cherries. 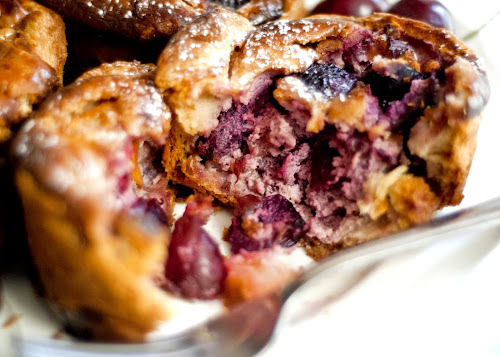 But it was the taste of it that made me a believer in the value of baked cherries. I saved some for my husband and the little fellas, too. The youngest one couldn't get enough. And that alone was worth all the effort. Preheat oven to 350 degrees. Separate crescent dough triangles. 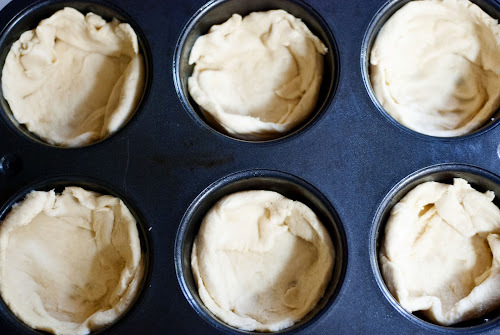 Line each cup of the greased muffin pan with a triangle, creating a thin layer on the bottom and lifting the dough up to the sides. Use extra triangles to add more dough along the side of cups if necessary. In a medium bowl, mix 6 oz. cream cheese with 1 tbsp confectioners' sugar until smooth. Mix in beaten eggs. Set aside 1/4 cup cherries for topping. Chop remaining cherries. 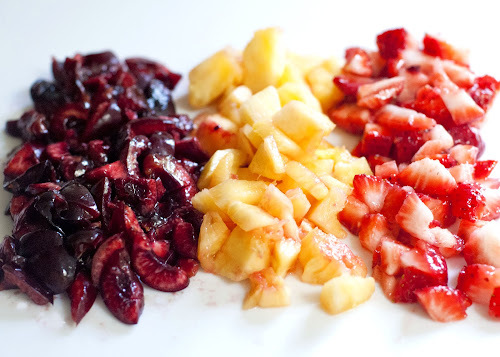 Gently fold chopped cherries, pineapple, and strawberries into the mixture. Pour fruit and cheese mixture into each cup. 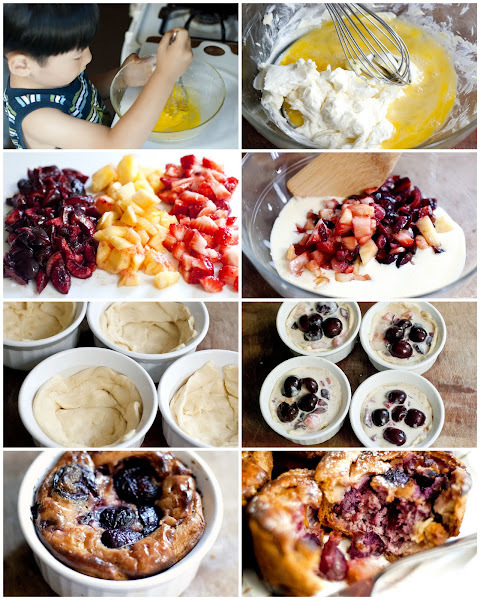 Top each with a few halved cherries. Bake in oven for 30-35 minutes or longer until the rims of the tart are golden brown and the filling is firm. Cool for 10 minutes in the pan before removing. Dust with confectioners' sugar and serve warm with a scoop of vanilla ice cream.